Keto Kubes are created by two keto warriors, Kaya and Nick, who had the idea of creating a dairy-free keto dessert that whole foodies would appreciate. I’ve had my fair share of dairy-free fat bombs that aren’t that appealing. Sure, they taste great but they’re not fancy. Keto Kubes are different. Each Kube is filled with cashew butter, coated in a thin layer of chocolate, and topped with a couple of pieces of real cacao bits for the perfect crunch. 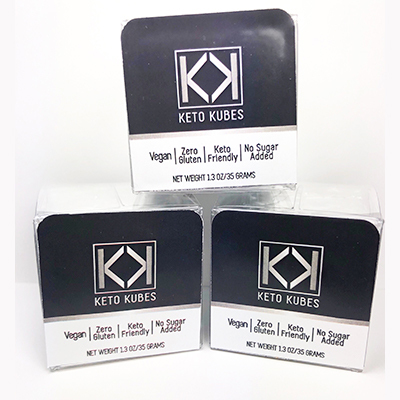 The Kubes come in cashew vanilla or cashew vanilla with 25mg of CBD oil. Two thumbs up from me! Now, the trick is only eating 1 a day and not… 4.